Every once in a while, the thought of getting a tattoo crosses my mind. Sometimes I roll certain ideas or sayings or tributes around in my head, thinking on what, if anything, I should permanently etch into my skin. Lately, the word “practice” comes to mind. I’ve been going to yoga for a little over a year, and the idea of practice is very important in yoga. Nothing is final, you don’t have to stick a pose or master it right away. By constantly doing sequences and classes, you’re practicing and learning more about yourself each time. It’s become really clear that the idea of practice extends far beyond yoga. Everything I do is improvement, a lesson, a reminder that everything is a practice. It’s not perfect and that’s okay (which as a lot of the time perfectionist is hard to accept). The whole practice makes perfect idea is a maddening trap. I noticed a few weeks back that I didn’t feel excited by breakfast anymore. I would feel the time crunch to make oatmeal and eat it before dashing off to work, or feel guilty for hiding in our tiny office kitchen eating it. Or, I would stop by Whole Foods and grab a smoothie or protein bar. None of this is terrible, but I could just feel breakfast slipping into something I didn’t like- eating slightly more processed food or not eating at home and spending more money when I had so much at home already. So with idea of practice, I adjusted to move back towards something that felt more in line with how I want to enjoy breakfast. It’s not quite warm enough for smoothies yet (and I work in a very cold office), so I decided to stick with something baked that I could heat up. To alleviate some of the time crunch, I looked for something that I could make ahead of time that also wouldn’t take too much time to make (quiche cups have been my other go-to make ahead breakfast, but that has a lot more steps then I want right now). Baked Oatmeal came up as the recipe to try out. 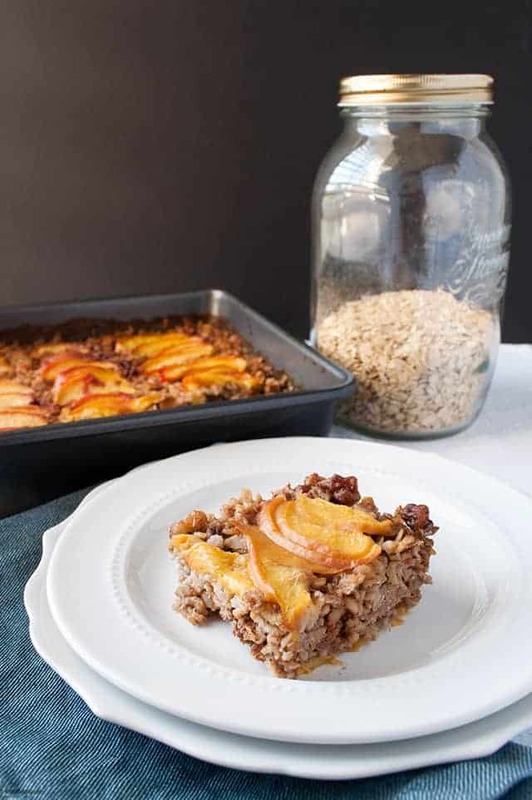 This Peach Baked Oatmeal checks a lot of boxes for me: made from pantry ingredients, quick to eat in the morning, not too hard to make over the weekend, light in sugar, a way I can get my collagen in for the day. Just what I need to get back to a kind of breakfast I need. It can also be customized to my tastes each week, with different nuts or seasonal fruits. I added an additional twist to my baked oatmeal that I put in my regular oatmeal: Vital Protein’s Collagen Peptides. Collagen peptides are a flavorless powdered collagen that dissolves in liquid and keeps it nutrition in hot or cold water. Collagen is important for skin, joint, hair health and can help with post workout recovery (it’s extremely high in amino acids, which aid in muscle recovery). When I first heard about it, I thought it was kind of a vain product— collagen’s usually marketed as some kind of anti-aging, fighting the hands of time supplement that’s in cosmetics. But, after learning about what else it could do, I tried it. And I was amazed! I’ve had dry skin most of my life (especially in the winter), and while taking collagen peptides, my skin didn’t get super dry. My hair got a little stronger and my next day/second day soreness after a workout was just a little less. There are more collagen brands popping up, but what I really like about Vital Proteins (and I’m not getting anything to say this, I’m just a believer in this brand) is that they’re sustainably sourced. The main reason I don’t eat a lot of meat (or blog about it) is because I want higher quality sustainable, ethical meat that’s out of my budget. So instead of a lower quality meat, I just opt out. The beef (there’s also a Marine version if you don’t eat beef) the collagen’s made from is pasture-raised and grass fed, which is the most ideal way to raise an animal. Like a lot of my recipes, this is also flexible for you to add your own tastes to. 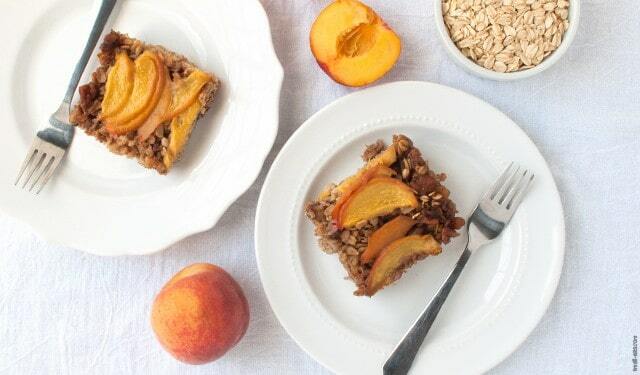 You can swap out the walnuts with any other nut or seed (I made a version with hemp seeds this week, so good) and change the peaches to your favorite summer fruit, or even any fruit if it’s not summer. If you’re vegetarian or vegan, you can easily remove the collagen peptides from the recipe and it won’t affect it. When you notice yourself slipping into old habits you thought you moved away from or you see yourself doing things that may not help you down the road, readjust with kindness. Return to the things you know you need or try something new that can prevent older habits from repeating. Everything is just a practice, after all. In a medium mixing bowl, combine the oats, walnuts, baking powder, and spices. Stir throughly. In a smaller bowl, combine milk, honey, egg, coconut oil, vanilla and collagen peptides. Whisk until blended and until peptides have dissolved. 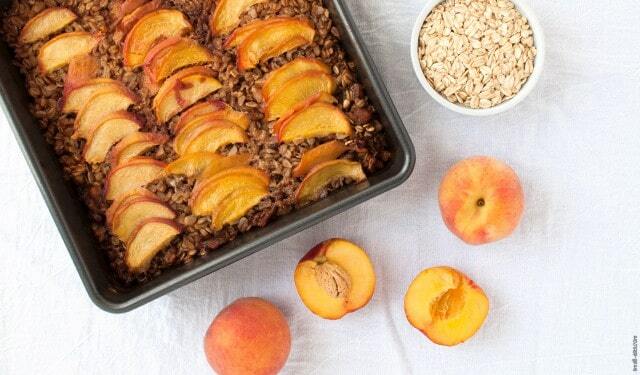 Arrange a single layer of peaches at the bottom of the baking dish. Pour oat mixing on top of peaches. Evenly pour the wet mixture over the oats. Arrange the rest of the peaches on the top. Bake for 43-45 minutes until top is golden. Allow to cook for ten minutes until cutting to storing. Adapted from Cookie and Katie.